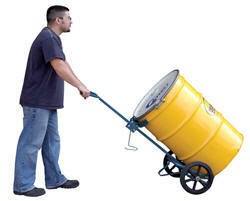 The Barrel/Drum Truck handles 30 and 55-gallon steel and fiber drums that are 24" to 48" high. Adjustable chime hook helps to secure the drum. 12" x 2" wheels available for models DBT-1200 and DBT-1200-P. 10" x 2" wheels are available on the DBT-RED. 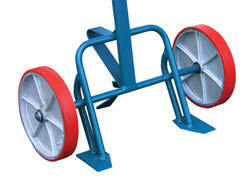 Wheel types include rubber on steel, poly-on-steel or polyurethane. Uniform capacity is 800 pounds. DBT-1200 series features a kickstand for holding unit at a tilt. 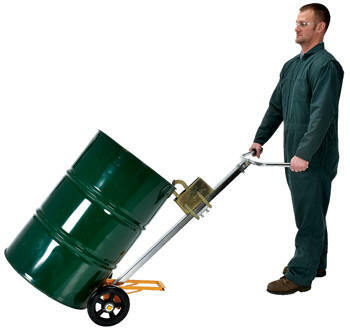 Move, tilt and unload heavy 30 or 55-gallon steel drums with ease. 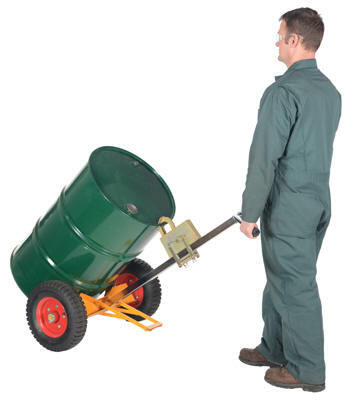 A foot rest helps in loading and supports a loaded drum truck. Unit rolls quietly on 10" x 2" mold-on-rubber wheels. Deluxe chime gripper for quick and easy drum transportation. Assembly required. DBT-1000 rolls quietly on 10"x2" mold-on-rubber wheels. 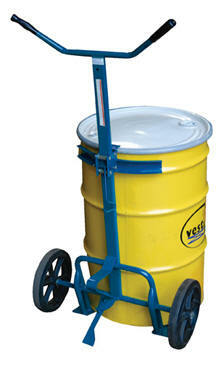 DBT-1000-PN features 15-3/4"x4" pneumatic wheels.